Syracuse faded late in the second half, dropping a 78-69 game to Baylor in the first round of the NCAA Tournament. The Orange (20-14) hit 54.5 percent of their shots in the first half, including 9-of-17 threes, but closed the night by missing 12 of 14 shots after knotting the score at 57 a side. The 9-seed Bears (20-13), meanwhile, posted runs of 11-2 and 8-2 in the game’s final ten minutes, ending the season of eighth-seeded SU. Syracuse shot 31 percent in the second half while Baylor shot over 50 percent in both halves. The Bears blistered the nets from deep, connecting on a season-best 16 three-pointers, including ten before halftime. The Orange kept pace early, hitting nine threes in the first half, but connected on just 3-of-12 shots from long range in the second half. SU played without Frank Howard, who was suspended for a violation of academic department policy. Buddy Boeheim replaced him in the starting lineup, but mustered only a pair of free throws, missing all six of his shots from the floor. Baylor set the tone for the night in the opening minutes, hitting five threes in just over four minutes as they ripped off a 15-4 run to start the contest. Elijah Hughes responded with back-to-back treys to slice the margin down to five. Following another Bears triple, Oshae Brissett and Tyus Battle connected from beyond the arc to pull Syracuse within 18-16 less than eight minutes into the action. A little over three-and-a-half minutes later, the Orange rattled off nine straight points to grab the lead for the first time. Marek Dolezaj slid a pass to Brissett for a dunk, who also added a triple to bring SU within a single point. Battle then hit a three from the left corner while fouled and tacked on the free throw for a 28-25 lead with under seven minutes to go in the half. 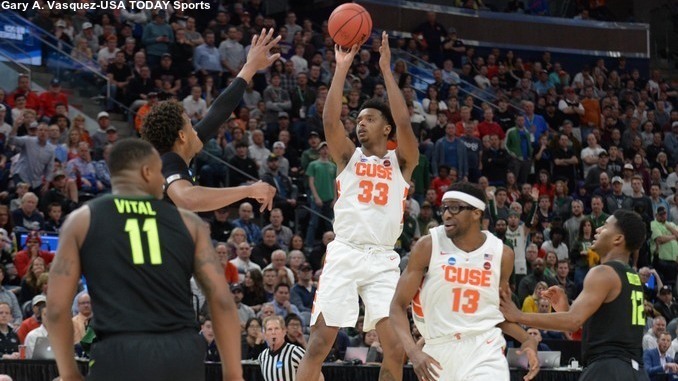 After a Baylor basket, Hughes connected from long range once more, stretching the lead to 31-27, the largest Syracuse edge of the game. The Bears responded with eight of the game’s next nine points for a 35-32 lead. Hughes broke the run with his fifth triple of the opening half, knotting the score. Baylor matched the three, but Buddy Boeheim canned two free throws to bring the Orange within 38-37 at halftime. The lead ping-ponged between the two sides in the opening minutes of the second half as neither side mustered consecutive scores until Dolezaj swished a left wing three and Battle leaked out for a slam and a 53-50 SU lead seven minutes out of the break. The Bears went back on top and Syracuse tied the game twice, the latter coming at 57-57 just past the midpoint of the second half. The Orange offense went into the cooler, failing to make a field goal for nearly five minutes. Baylor took advantage, rolling up an 11-2 run for a 68-59 lead. Hughes buried a straightaway three and tacked on three foul shots on the next possession, bringing SU within three. The redshirt sophomore then fed Paschal Chukwu for a lay-up on the heels of a Bears basket, bringing Syracuse within 70-67 with a little over three minutes left. That Chukwu lay-in would be the last Orange basket of the season, as the Bears closed the night with eight of the game’s final ten points. Chukwu made a pair of free throws with just under a minute on the clock to bring SU within five, but Baylor beat the full-court press with a long pass for a slam and a 76-69 lead. Battle missed a pair of shots around a missed free throw by the Bears, effectively ending the season. Baylor then added two more foul shots and, following another miss on offense, Jim Boeheim called off the defense. Elijah Hughes made six three-pointers as he posted 25 points for the Orange, including 18 in the first half. Tyus Battle added 16 points, hitting three triples. Oshae Brissett had ten points in the first half as he finished with 14 points and a game-high eight rebounds. Makai Mason paced Baylor with 22 points. Both Mason and Jared Butler, who added 14 points for the Bears, hit four three-pointers. Mario Kegler and King McClure each connected from long range three times as Kegler had 13 points and McClure added nine.